In real estate, particularly in housing, national averages elegantly paper over the gritty details on the ground in specific metro areas and neighborhoods. When a new trend starts in some locations, it’s neutered by data from other locations. Blips and squiggles are averaged out of the picture. But by the time changes consistently show up in national averages, they’ve taken on serious weight on the ground. And now the “smart money” – smart because it has access to the Fed’s free moolah – is abandoning the housing market. Wall Street money entered the housing market gingerly in 2010 and 2011, then piled helter-skelter into select metro areas over the next two years, grabbing vacant single-family homes out of foreclosure with the goal of first renting them out, then selling to yield-desperate investors and unsuspecting mutual-fund holders their latest toxic concoction: rent-backed structured securities that are even worse than the mortgage-backed structured securities that helped take down the financial system only a few years ago. It worked. Each wave of buying ratcheted up prices via the multiplier effect, not only in the neighborhood but beyond. It created instant and juicy paper gains on all prior purchases. In this way, the same companies, now mega-landlords, were able to push up the value of their own holdings with new waves of purchases. It was a wonderful game while it lasted. And it was funded with nearly free money the Fed graciously made available to the largest players. Housing Bubble 2 came into full bloom. But these billions of dollars being pumped into the housing market had the effect of pushing prices out of reach for many potential homeowners who’d actually live in these homes. And first-time buyers, the bedrock of the housing market? Well, forget it. Their share of purchases dropped to 33%, the lowest since 1987. 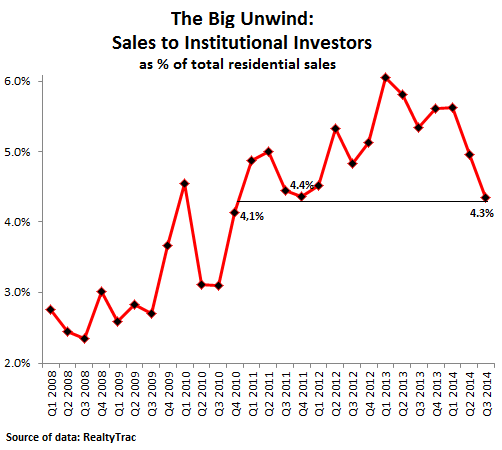 Sales to institutional investors in the third quarter plunged to 4.3% of all sales, RealtyTrac reported. It was the lowest level since Q4 2010. The big unwind. This is how the “smart money,” coddled by the Fed and encouraged to do just these sorts of things, has reacted to the recent home prices that it so strenuously inflated: It bailed out. This chart shows that the peak of institutional frenzy occurred in Q1 of 2013. After that, institutional investors – defined by RealtyTrac as entities that purchase at least 10 properties per year – started having second thoughts about the new price levels in some of the hottest markets. But other markets hadn’t caught up, and investors shifted their focus to them. The national averages initially covered up much of the drama on the ground. Institutional investors are still active, but much less so on a national basis, and they “continue to gravitate toward markets where lower-end inventory is still available,” said RealtyTrac VP Daren Blomquist. And when they’ve pushed this lower-end inventory out of reach for the strung-out American middle class, they’ll throw in the towel there too. While Memphis was number one in the third quarter, its institutional investor share of 16.4% was actually down from 20.3% a year ago. But some metro areas had year-over-year increases, including most notably Miami from 6.3% to 8.6%, Tampa from 7.5% to 8.6%, and Knoxville from 4.5% to 7.0%. These ups and downs by metro area indicate how the “smart money” comes and goes in waves, focusing on specific markets to ratchet up prices that will provide them with instant paper gains. And not much later, they’ll collect a pile of cash from the securitization of rents. They did exactly what the Fed in its genius wanted them to do. In the process, they turned homes into an asset class for Wall Street firms and further deflated the American Dream of homeownership [The American Dream Going Bust – in One Chart]. 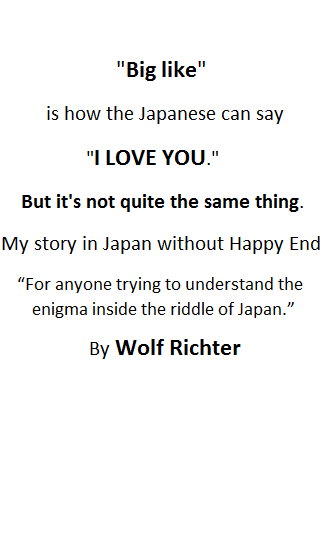 Wolf, with due respect, I think you and many others have this whole thing backwards. I believe (and may be wrong) that the private equity buy-up of single family houses was Fed/Treasury engineering under the guise of these guys building a rental empire. I never bought into that line as I am a landlord with 2 duplexes (4 units) and realize it’s not as simple/easy as many make it. Further, I believe the real intent was to raise the level of housing prices as far as the market would allow to 1) stop the slide in prices (e.g., Arizona), 2) restore equity for existing homeowners and 3) allow the PEs to make some money (if not in this venture believe me they didn’t take this on with only the goodness of their heart). I live in Charlotte and we were indeed on the tail end of the PE buyup. While I was reading about this for months in the hard hit states, nothing was moving here. In the last year, a noticeable increase in prices occurred and while I can’t prove it directly, I believe there was a bit of an invisible hand helping lift those offers. As to where we are now; well prices will have to fall. As you correctly point out, many/most areas got ahead of themselves (happened in my neighborhood as well). Some people got all lathered up and started back into flipping (my new neighbor) but may likely loose their butts or at least not be able to sell for a very long time. And of course most of the younger generation can’t even afford the current price level even if it were reduced somewhat. And I think we may not have seen the last of the PE influence; although their big buy-up over the past couple of years will certainly end. I have managed properties for others for decades and also have read about PE buying/renting/selling model for a few years now. Renting homes isn’t a great wealth builder unless you manage them yourself. Buy low and hold a very long time. Paying someone else to manage your single family residence is in itself risky as the management fees seldom are adequate to really do a good job so many Property Managers are more interested in keeping the home rented than making sure the owner’s asset is fully protected. It also is very hard to find really good long term renters as turn over is a killer with big costs every time. Even those good renters end up in bad situations with losses of jobs and medical issues plus kids and irresponsible friends.. I have seen all kinds. The one who’s kids used the stairs for a slide and punched holes in the wall at the bottom or the guy who rebuilt his Harley on the living room carpet. Both appeared to be good renters on paper. References can be faked too.. The renter class is not generally the same as the owner class either. People who own, never let the drippy sink drain drip until the cabinetry and sometimes the floor, sub floor and even the wall behind the sink destroyed. There is never enough security deposit to take care of the problems. And the same kind of people who run the PE groups are the kind who believe in a form of free enterprise where as keeping wages and benefits low plus indenturing our youth thru student loans for their profit is good policy. All this appears to be a train wreck coming with both rents and ownership costs way above the working person’s ability. Many early in PE groups are already selling on terms and then reselling the revenue of these loans. I have no idea how this all will work out when the 2nd real estate bubble pops but I think most of us are going to wish we’d had some real financial reform before all this is over.. And then we will get it as the mess I think will be horrendous. The corporate takeover of the rental market in Florida is not going to end well. Nobody is waiting in line to buy these houses. The houses were stripped during the foreclosure crisis, barely patched up for the rental market, and are now poorly maintained in order to make a profit. Rents are unaffordable forcing families to double and triple up. At some point I anticipate some kind of rent control to be called for and then the value of the homes will collapse. Economicminor, I combined both of your comments into one and posted it on the front page, right column. Thanks! I didn’t mention one of the biggest costs in owning rentals.. that is when you try and get a renter to move. In my state and I believe in most states, renters have more rights than owner. I had one this year where the renter’s dad bought her a home. She got some help moving from a couple of druggies.. They had keys to the property and when she moved out, they moved in. The local police said that these were tenants because my tenant in effect sub rented, even though this was explicedly prohibited in our rental agreement. The polices said this was a civil matter.. So I filed to evict with the local court..
Bottom line, it took 4 months and $3000 worth of damage plus legal fees and court costs to get them out.. Then they kept breaking in so we had to hire a care taker to live there and that became a problem so the owner just sold the property.. Some of this was because of the local condition of the lack of police funding but some of it had to do with the laws protecting people from owners. All I have to say to the PE groups who have this great model for making a killing is Good Luck! You show no evidence for a “Big Unwind”. Institutional investors have reduced their portion of total purchases from a 6% peak to 4.3% of the total market. That’d not much of the market. 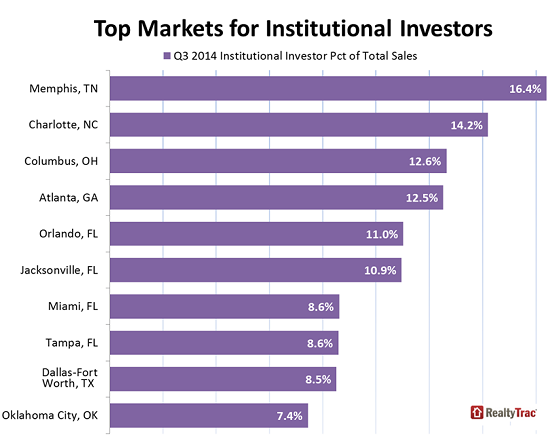 An unwind would indicate institutions are reducing their residential real estate portfolios. Is there any evidence of that? Alan, the reduction in purchases by institutional investors – as RealtyTrac figures them – represents a 28% reduction in share nationwide. As I pointed out, their waves of purchases move from market to market. And total sales have been declining as well, so their raw purchases have dropped even more sharply. They’ve stopped buying altogether in some of the erstwhile hottest markets, and some investors have started unloading properties where they can. This might take several forms, including selling their properties outright or selling them to the public via an IPO of a hastily formed REIT. All of this has already happened. And I’ve written about it at length in the past. This article was about changes in their buying behavior (and not about what they do afterwards with those properties). Wolf, can you say anything specific about SF Bay Area market? In SF, where I live, the exuberance is boundless. Real estate is topic of conversation in the sauna where we warm up after our swim in the Bay. I haven’t seen that before. This summer, a number of properties came up for sale within two blocks of where I live. I hadn’t seen anything go up for sale since 2011. Some of them sat for a couple of months. One of them sold. I think one or two might have been pulled off the market. The rest I don’t know. Maybe they’re going to wait for sunnier times. Sellers want to max out the price, but those prices are so high, few people can afford them (median price of an apartment in SF is close to $1 million … for a two-bedroom, no view, no garage unit in a so-so area). But SF is a rental market. So a lot of the housing stock is already investor-owned, many of them small-time investors. Condo and apartment towers (including one of “micro-apartments”) are sprouting like mushrooms in some parts of the city. And there are a lot of new units coming on the market shortly. The biggest Chinese developers are now active in SF as well. So this will be interesting. Currently, the tech bubble keeps bringing in people. Once that stops, and once the layoffs start (as they always do), the dynamics will change. Been there, done that. Housing in the rest of the Bay Area is all over the place, from some tough cities in the East Bay (even they picked up a lot of speed recently) to some of the wealthiest places in the country, like Atherton, down (from me) on the Peninsula. There has been a veritable investor feeding frenzy in 2010/11/12 in the East Bay, in cities like Oakland. I think that stopped a while ago. At the time, a friend of mine tried to buy a house at a foreclosure auction in Oakland and was up against a dozen bidders from PE funds and others. My only point is that title of your article is a miss match for the content. If it is a continuing thread my apologies I am an occasional not a regular reader. I do find your posts interesting and helpful critical thinking. Alan, I understand your point. Titles are always tricky and rarely perfect. Thanks for reading my stuff and for commenting on it. If you want to have a look at all my housing stuff, check out the “Housing Bubble 2” tab at the top. In early 2013, I called the phenomenon “Housing Bubble 2” and from then on documented how it inflated, the craziness of it all, much of it in CA. Then I documented the various indications of turning points. Now I’m documenting the next steps, wherever they lead us…. I think The original game plan was to buy up the houses and then bundle them into REITs to sell to yield-seeking fools. Unfortunately there was a shortage of fools who thought you could manage single houses like you do apartments. Some very astute comments. Single family landlording was traditionally a business for small local landlords who usually owned maybe 5-15 houses and sometimes a few apartments. They made money by owning for a long time, screening their tenants very carefully, managing their own places, and doing most of their own repairs. I had a property management company for some years and a number of rental properties for quite a bit longer. Hard to make money in single family if you call a contractor to fix everything, repairs cost too much. In terms of screening, I turned down as many as twenty applicants in a row for a house, mostly for lying in their applications, but also for evictions they failed to note, failure to pay utility bills, etc. It’s very laborious to screen properly, credit report alone is not adequate at all, so many landlords take the easy way out and rent to somebody with OK credit who talks a good game. As a landlord you tend to lose your best tenants when they buy a house. Many, many tenants rent because they are too irresponsible to buy a house-not good with their money, neglect repairs, don’t know how to fix anything properly. Buying and selling foreclosed houses can be a good business (that’s what I did on a small scale) but you have to realize that many foreclosed houses are foreclosed over and over again. I’ve seen the same house foreclosed on 4 or 5 times over 15 years or so. Many of these foreclosed houses have odd floor plans, are in marginal neighborhoods, have mediocre to poor construction quality, etc. Marginal buyers buy marginal houses because sometimes that’s all they can afford, and often because they just don’t know good or bad construction quality when they see it. When the market is good anything with an address will sell, when the market is bad, lenders won’t lend on the shacks they used to lend on, many buyers can’t qualify anymore. Many of these houses being sold by PE firms now will just be foreclosed again in a few years. Someone should do a study showing how much prices drop on these houses within 5 years. Bobster111, I posted your comment on the front page, right column. Thanks.